During a recent visit to NYC with friends, we walked past a startling visual display along the fence line of Marble Collegiate Church. I had a pretty good idea the ribbons signified something about desires for peace amidst our conflict involvement around the globe. There was a sign that explained: It's a visual prayer for peace commemorating those who have died in our war against the people of Iraq. (NOTE: The peace sentiment is theirs; the characterization of our war is mine). Having spent time in Iraq with Christian Peacemaker Teams (CPT) engaged in efforts towards peace, I was immediately saddened by the visual. The visual impact of the ribbons conveys the message that American dead outnumber Iraqi dead by a margin of something like 1,000 to one, when in fact, the truth is the absolute reverse, particularly if the wounded and displaced are included in the calculus. Why should this matter? Isn't it important that the faithful of Marble Church are praying for peace? Of course it is. 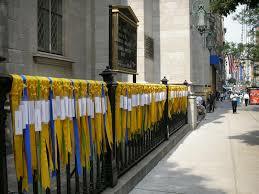 Aren't the ribbons a good thing, in that they remind passers by to do the same thing? I'm not so sure, especially when the visual message is that our suffering, as Americans, is so much bigger, and thus so much more important, than the suffering of the Iraqi people, whose land was invaded and remains occupied, whose lives were upended in ways we cannot begin to imagine unless we've seen with our own eyes, and who, to this day, struggle to find ways for we Americans to understand that their land is not ours, that their suffering is not ours, that their way to peace is for them, and not for us, to determine. If we would convert our prayers for peace from self-interest to mutual interest or even better, other interest, we must begin by telling the story as it actually is: for all we have suffered; they have suffered thousands of times more. With such an understanding, maybe we in these United States can move from generic prayers for peace in our public spaces to prayers of repentance and guidance that will make the pathway to our part of the peace solutions and grant space for others to make their own pathways as we make our own. When you see the ribbons at the Marble Church, remember that the yellow ones are lost in a sea of black, for black is the color of loss in Iraq.